Plants grow best if their soil preferences are met. Some love acidic soil and others prefer alkaline soil. Growing plants in acidic soil when they need alkalinity can affect their growth due to mineral deficiencies. Lime is a common way to make soil more alkaline. While granular and powder forms are often used by gardeners and farmers, lime juice can also be added to alter the composition of soil. Soil pH indicates the acidity or alkalinity of your garden or yard. Certain plants grow better in certain types of soil. It's fairly easy to test the pH of your garden using a soil test kit, available at nurseries and garden centers. Take samples from across the yard to ensure an accurate result. The kit will tell you where on the scale, from 0 to 14, the pH lies. Below 7 indicates acidic soil, while above 7 indicates an alkaline base. A pH between 6 and 8 is considered neutral. If the pH is acidic, lime can be added to make the soil more alkaline. Compare your soil pH with the needs of the plants you want to put in the ground. Flowering bushes like azaleas and rhododendrons grow best in acidic soil with a pH between 5.0 and 5.8. Strawberry and birch trees, as well as camellia and huckleberry prefer a pH between 5 and 6. Tomatoes and sunflowers also prefer acidic soil. If you're trying to grow alkaline-tolerant plants like smoke tree, rose of sharon, juniper, sprice or locust, your soil is likely too acidic for those plants. To increase the pH and make the soil more alkaline, pour 1 tbsp. of lime juice into a container with 1 gallon of water. Pour the solution around the bottom of each plant. As it works its way into the soil, the dirt should become less acidic, and the plants should grow better. Test the soil regularly to make sure it's falling into an acceptable range. 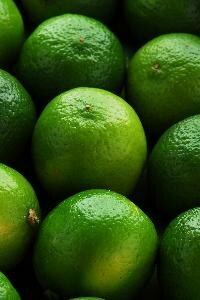 In addition to lime juice, there are many other types of lime that can be used to treat soil. Hydrated lime, calcitic limestone and dolomitic limestone are used commonly in garden applications. Lime is not water-soluble in its material form, so gardeners routinely use particle or pellet forms of it. The benefit of using a particle-form is that it will travel deep into the soil, affecting the pH evenly. The substances should be worked into the soil with garden tools until well blended. Plants that need acidic soil but are instead growing in alkaline soil may show the signs of zinc deficiency on older leaves and/or copper and iron deficiencies on their younger leaves. Look for a yellow or brown appearance to the leaves. A zinc deficiency, in particular, causes a brown stripe in the center of the green leaf. A loss of iron will make the leaf take on a thinly-striped appearance. Lime juice comes in handy when you preserve and pickle garden plants. It can be used in place of vinegar. Test the pH of pickled solutions before you can items to make sure the pH is accurate. Pickled foods should have a pH between 0 and 4.2. If the test shows a pH above that mark, pour more lime juice into the solution. Test it again until it falls in the desired range.